I am not a frequent scarf knitter. I've tried simple and challenging, side-to-side and end-to-end; they have all felt like forced marches sooner or later. 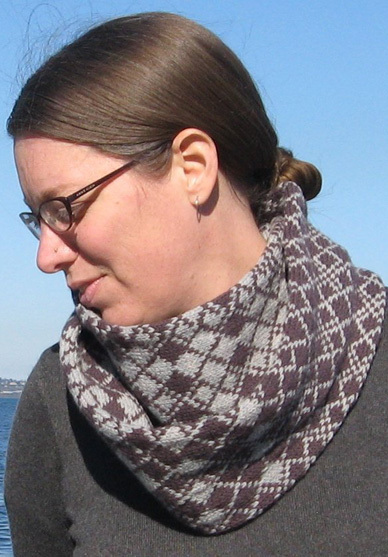 So I set out to design a scarf that I would actually enjoy knitting as much as wearing. Worn long and loose, it's an interesting gradient from light to dark and back again. Doubled up, you can choose to stack the light and dark inverse patterns or keep the matching argyles front and center. 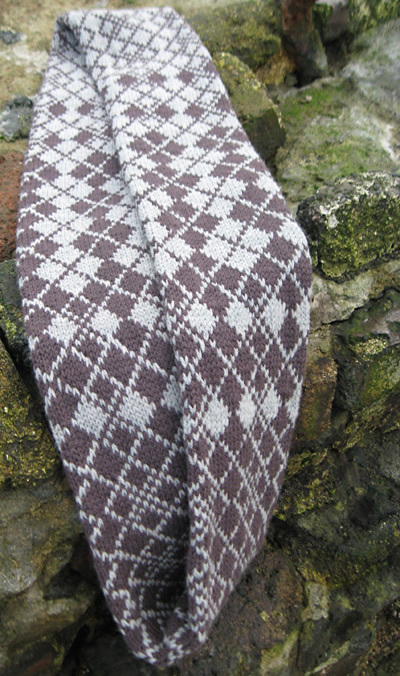 The scarf is finished by grafting your live stitches to the cast-on edge. This allows the color pattern to be joined invisibly without a plain row or a half-stitch offset. The cast-on edge is hidden inside the tubular fabric. This version of grafting is used less commonly than the usual method that joins two sets of live stitches, but it's not any trickier. Set up: Thread yarn on a tapestry needle. 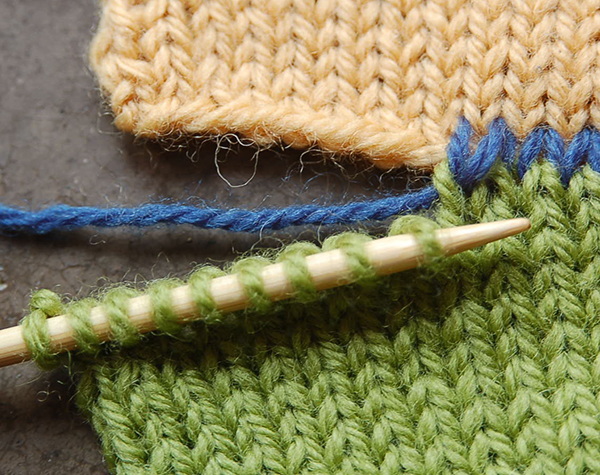 Arrange knitting so that the fabric with live stitches is below and cast-on edge is directly above. 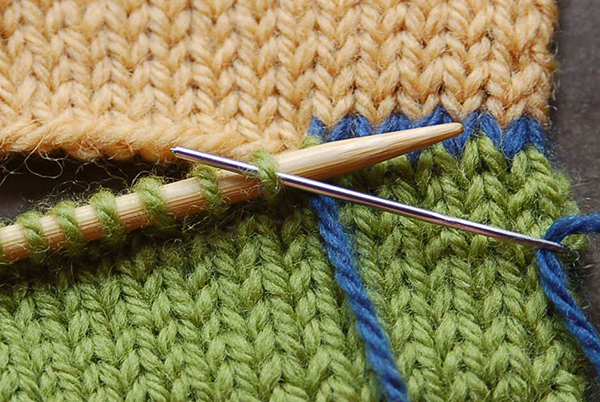 Identify the row of stitches you will join to above the cast-on edge. In many cases, you will join immediately above the cast-on. 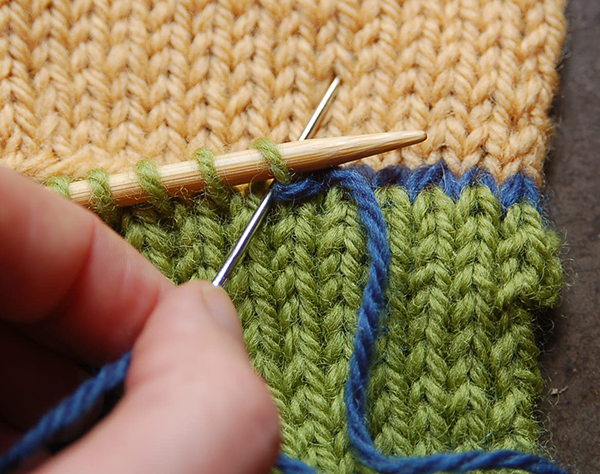 However, if you used a long-tail cast-on and then began a pattern in the next row, you will need to graft to the second row of stitches. 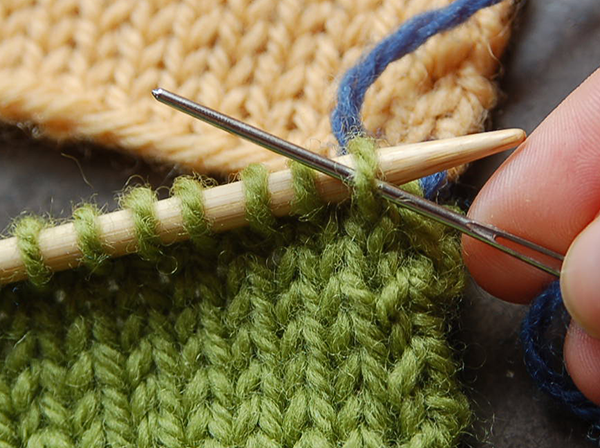 This is because the long-tail cast-on produces both a cast-on and an initial row of knit stitches at the same time, which will not be in pattern. Because the long-tail is my default cast-on, the photos reflect this adjustment. Step 1: Insert needle purlwise into first live stitch on needle. Pull yarn through, keeping the stitch on the needle. Step 2: Pass the needle from right two left behind both legs of the “V” of the first stitch of the row you are joining to above the cast-on edge. Step 3: Insert needle knitwise into the first live stitch on the needle. Pull yarn through, dropping the stitch from the needle. 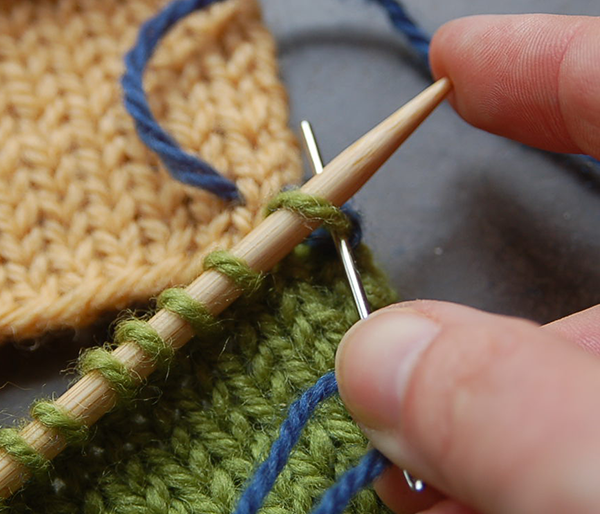 As with any grafting technique, it is helpful to keep your working yarn behind/below the knitting needle holding your stitches. For a truly invisible graft, you will need to match the tension of the fabric. I find it easiest to pause frequently and insert the darning needle into my graft stitches to even out their tension and work out any slack. 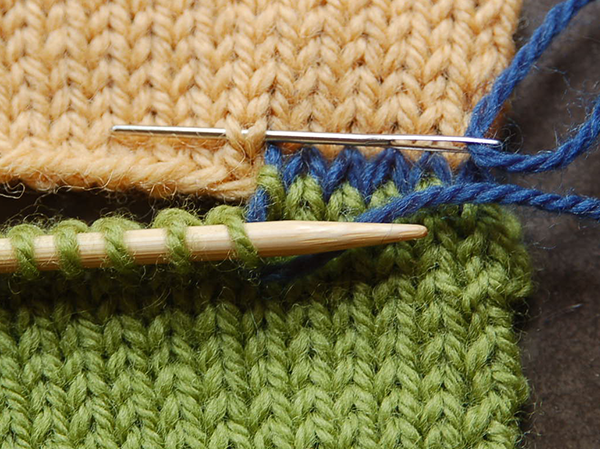 To graft a row requiring two colors, thread a needle onto each and complete the sequence in the appropriate color for each stitch, changing yarns after step 3 as needed. 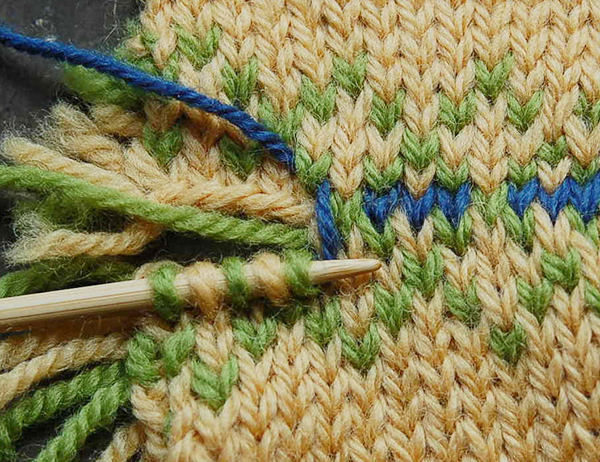 In the sample below, I have grafted the yellow stitches in blue and the green stitches in green to show how this technique can be used to complete a pattern seamlessly. Using MC, cast on 64 stitches. Place marker and join for working in the round. Join CC and work Chart A 4 times around. 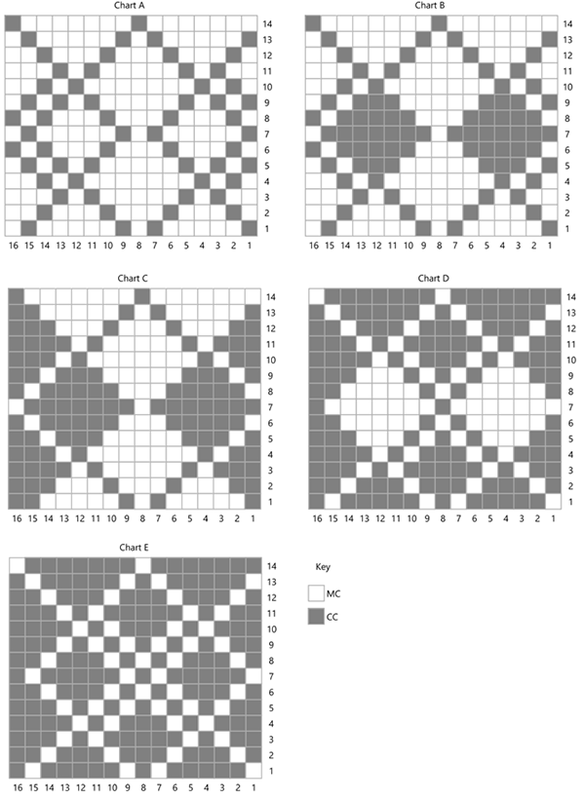 Work as set until 2 repeats of Chart A are complete. Work 2 repeats of Chart B. Work 3 repeats of Chart C.
Work rows 1-7 of Chart C.
Work 2 repeats of Chart D.
Work 5 repeats of Chart E.
Work rows 8-14 of Chart C.
Work 3 full repeats of Chart C.
Work 2 repeats of Chart A, then work rows 1-13 once more. Weave in all ends before closing scarf. 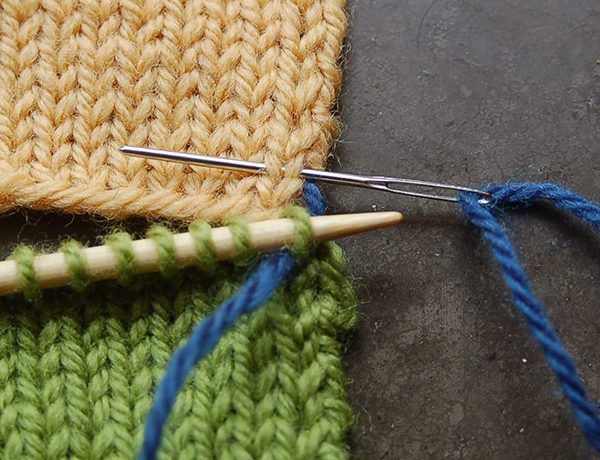 Graft the live stitches to the cast-on edge in pattern (row 14 of chart A). Weave in final ends and block. 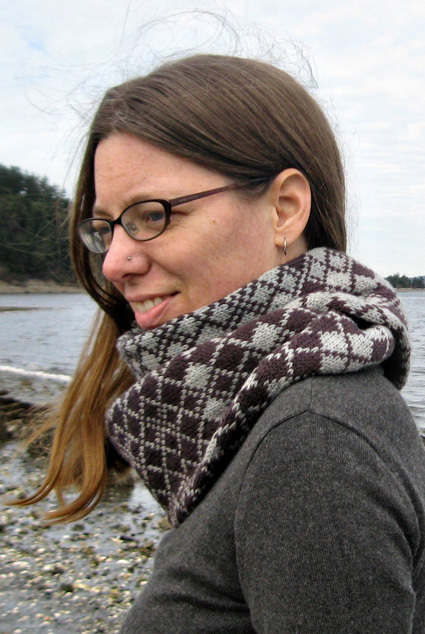 Bethany lives in the woods of the Olympic Peninsula in Washington State, where she fends off the insidious damp with all sorts of woolly knits. 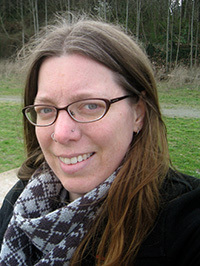 She blogs about homestead life, including knitting, at bethanyjune.com.